﻿Published by Sareth Ney on July 5, 2017 at 11:39 p.m.
SAN FRANCISCO – San Francisco Comedy Competition is accepting applications until Aug. 1. Preliminary events take place from Sept. 6 through Sept. 10 and Sept. 13 through Sept. 17. Semi-finals are from Sept. 19 through Sept. 23 and finals are from Sept. 27 through Oct. 1, 2017. 32 comedians are chosen to perform from around the world. According to the website, entrants are encouraged to “make the best possible impression” on the application. It will be entering the 42nd year. For those interested to participating in the San Francisco Comedy Competition, one must be 21 years of age and solo acts need only apply. The entry fee is $15. If applying to the Seattle International Comedy Festival, a $5 discount will apply. The deduction will be applied, if submitting to both festivals at the same time via the website. The form of payment accepted is through PayPal. The receipt number is required to be entered at the application screen. A short comedy biography of 100 words or less is required, as well as a five to 10 minute video. The footage must be consecutive and not a montage. The audio must be clear and the video should be too. The panel will view the first 10 minutes, for both San Francisco Comedy Competition and Seattle International Comedy Competition. 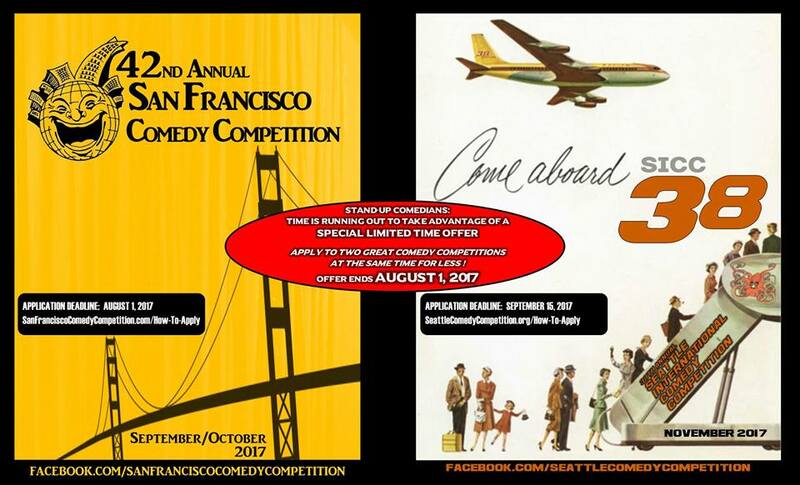 If chosen to perform at San Francisco Comedy Competition, the participant must perform at least one week of shows. If advancing to the semi-finals and finals, the time frame can be a total of up to four weeks. There will be a prize pool of $15,000 divided to those making it to the semi-finals and finals. The winner will receive $5,000. Past winners of San Francisco Comedy Competition consist of: Bill Farley, Dana Carvey, Mark McCollum, Marsha Warfield, Michael Pritchard, Ron Lucas, Jim Samuels, Will Durst, Doug Ferrari, Sinbad, Jake Johannsen, Warren Thomas, Mike Dugan, Dexter Madison, Christophe Collins, Don McMillan, Johnny Steele, Carlos Alazraqui, Jackie Flynn, Doug Stanhope, David Crowe, James Inman, Vinnie Favorito, Don Friesen (1999 and 2005), Danny Bevin, Bengt Washburn, Gerry Dee, Rob Pue, Jim Short, JayWendell Walker, Paul Ogata, Steve White, Tom Simmons, Auggie Smith, Sean Kent, Tony Baker, Samuel J. Comroe, Kabir Singh, Myles Weber and Alex Elkin. Runner-ups included Robin Williams and more. To apply to the San Francisco Competition and/or Seattle International Comedy Competition, click here. For more information, visit the website by clicking here.